The prime minister also criticised the earlier government over the issue of seats in medical colleges which, according to him, were much less than the requirement of doctors in the country. "Due to the rules formulated by the past governments, very few students were able to secure admission in the medical colleges. Thus, we have taken up the task of opening one medical college for (every) three to four Lok Sabha constituencies across the country. Since we also need good professors for such colleges, we have also increased 6,000 seats in PG medical courses in the last one year. Though some people criticised the move, we remained firm because we understand that we will need good professors for producing good doctors," Modi said. "Government of India is taking steps towards the empowerment of fishermen. We do not want our fishermen to live in poverty, we want to create more opportunities for them," Modi said in his Bharuch address. While claiming that the Sarovar dam was a result of government's sheer political will, Modi reiterated that the river Narmada is an integral part of Gujarat's economic and social life. "I have taken birth in the land of Gandhi and Sardar. So it does not matter how many thieves come and go, but ultimately truth and sincerity will win," Modi said in an apparent dig at the Opposition. "Urea subsidy used to reach chemical companies and not the farmers. These companies, who used to get the urea at cheap rates, used to sell products in the market. But the farmers were deprived of urea. The central government used to be looted," Modi said. "Whether it is Diwali or Chhat Puja, the train is a gift from the West of India to the people from UP and Bihar. Now they can connect with us.," Modi said. 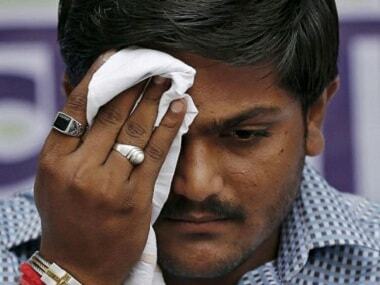 "Workers come to Gujarat to work but then on holidays, he has to reach home. But there are so many difficulties, especially for those from UP, Bihar. So, we have launched the train. This part of Deen Dayal Upadhayay's dream of Antyodaya," Modi said. Prime Minister Narendra Modi has launched the Antyodaya Express, which will run between Udhna in Gujarat to Jaynagar in Bihar. Interestingly, he flagged off the train via a video link. Modi will lay the foundation stone for Rs 3,000-crore Bhadbhut barrage project over river Narmada, as well as a Rs 650-crore Dahej-Ghogha Ro-Ro ferry service near Bharuch in South Gujarat. After that, Modi will fly off to New Delhi from Vadodara, CNN News18 reported. "Coming back to one's hometown and receiving such a warm welcome is special. I go back with your blessings and assure you that I will work even harder for the nation," said Modi, who is on a two-day visit to Gujarat. Whatever I am today is due to values I have learnt on this soil, among you all in Vadnagar," he added addressing a public meeting in Vadnagar. Read more here. Modi launched the "Intensified Mission Indradhanush" to accelerate progress towards the goal of full immunization coverage. "I am happy that I have got to inaugurate projects relating to the health sector, particularly Intensified Mission Indradhanush," said Modi. "Work is constantly being done to make healthcare affordable for the poor," he added. Pankaj Modi, a relative of the prime minister spoke to News18 on the mood in the town and said, "Gaon ka beta aa raha hai. Mood is ecstaitc in Vadnagar." Recalling Modi's childhood, Pankaj said, "He used to focus on his studies and when free, he used to sell tea at the railway station. During the Indo-Sino war, he reached the station and gave tea and food to soldiers." There were chants of "Modi-Modi" and flowers were showered on him at several places along the route of the roadshow. The locals told mediapersons it was a matter of great pride that the "son of the soil" was the prime minister and was visiting the town after a long time. "Immense love showered by people of Vadnagar gives me new energy to serve the nation with more zeal," PTI quoted Modi as saying while promising to work even more harder for the people of Gujarat. "Sharmistha lake is the heart of Vadnagar. We will make it a tourist hotspot," says Modi in his hometown. In a bid to reduce infant and maternal mortality rates in Gujarat, Modi urged doctors to work for free on the ninth day of every month. "This will help poor women to not travel far off places for delivering babies," Modi said. 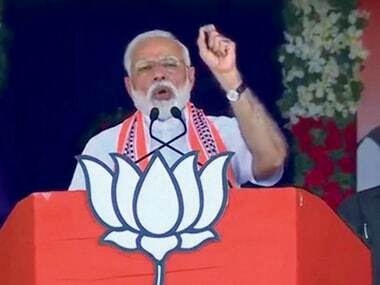 Slamming the UPA government for not bringing in a health policy, Modi said it was the Vajpayee government between 1998 and 2004, which brought a comprehensive health policy. He said that the UPA did not attach importance to the policy while it was after NDA came to power that the policy was renewed. "I request people to think Indradhanush as your own campaign. As much as you feel happy when you donate blood or do other charities, you should also help the poor children to get immunised. 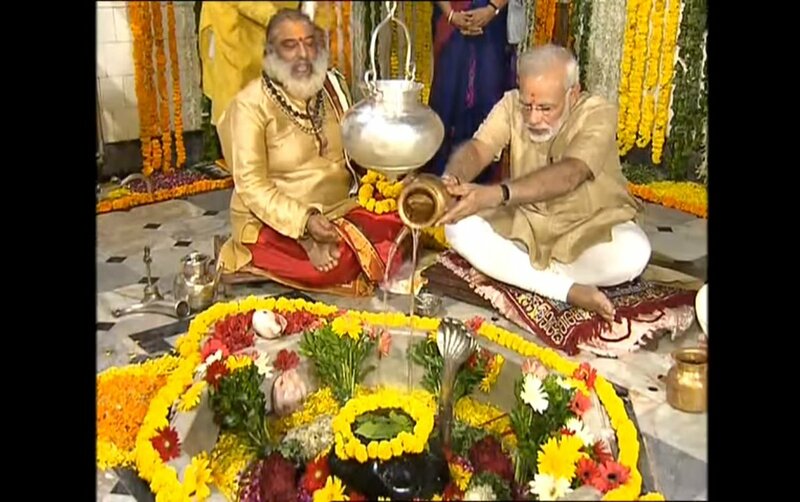 You will be blessed," says Modi. Modi said that the archeological excavations from Vadnagar have become the focal point of world community. He said that Vadnagar is now the only place in the world which has been continuously been inhabitant by people. Modi said that Vadnagar was a major Buddhist learning centre in the ancient times. "I will work harder for the people of Gujarat. I will work on the ideals taught by the people of Vadnagar, I promise it," Modi said. "Whatever I am today, it is all because of Vadnagar and its people," says Narendra Modi. "Once Carriappa went to his village, where he said that the experience of being welcomed by natives is something which cannot be compared," Modi said. "I feel the same," said Modi. 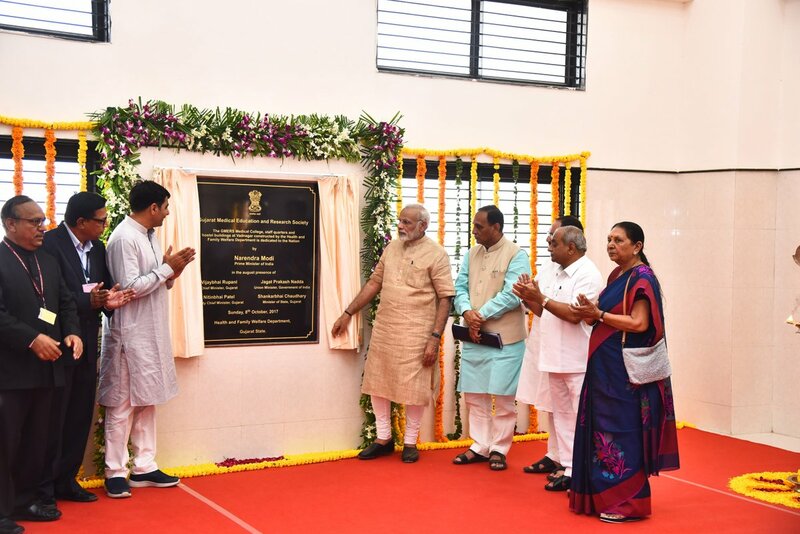 By Saturday afternoon itself, the prime minister had laid foundation stones of as many as six infrastructure projects: Signature sea link bridge from Dwarka to the popular island pilgrimage centre, Bet Dwarka, four-laning of Dwarka-Porbander highway as well as Gadu-Porbander road, four laning of Rajkot-Morbi state highway, six laning of major Ahmedabad-Rajkot highway and Rajkot International Airport. 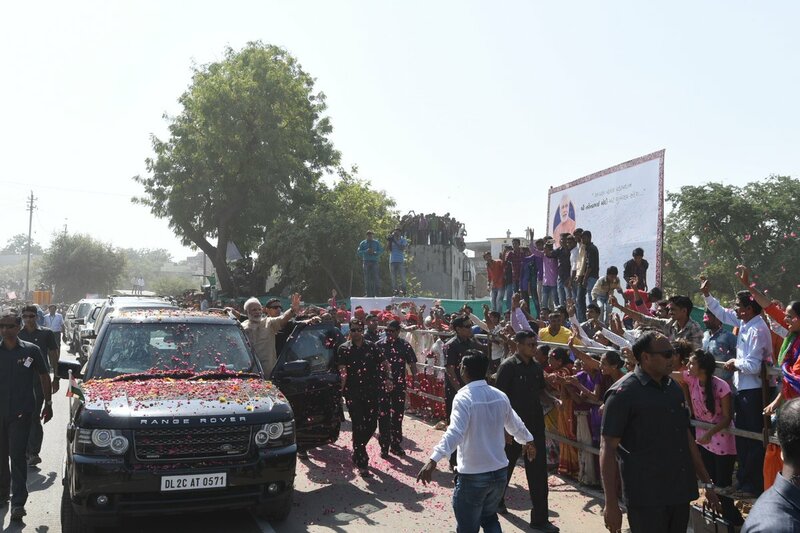 Hundreds of school students were mobilised by the local unit of the Bharatiy​a Janata Party to attend Modi's public address in his hometown Vadnagar, where he has come for the first time after becoming the prime minister in 2014. The students are attired in saffron or white dresses, with saffron caps. The T-shirts have the logo "Welcome NaMo." printed on them. Every nook and every corner of the town was choc-a-bloc with people to receive him. The massive crowds made an emotional Modi hold a roadshow that was not part of the itinerary. Modi hung out of his Range Rover SUV through the route and waved at the surging crowds. Gujarat Chief Minister Vijay Rupani, Deputy Chief Minister Nitin Patel and Union Minister JP Nadda are also present with Modi, News18 reports. Prime Minister Narendra Modi inaugurated a Rs 500 crore modern six-storey Civil Hospital associated with the local medical college. He interacted with the medical students in the college in their own classroom. This hospital is set to cater to lakhs of patients in North Gujarat and south Rajasthan, which borders the region. While visiting his school, an emotional Narendra Modi smeared his forehead with​ ​the sand of Vadnagar and kneeled his head to the ground. The BJP's biggest and the most loyal vote bank in Gujarat has been the urban middle class and GST has hit them the most, coming as it did after the sledgehammer impact of demonetisation. 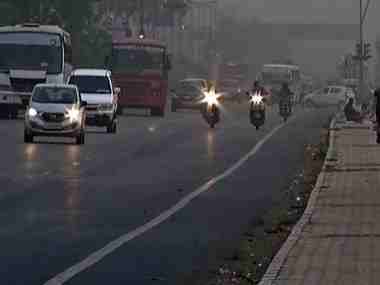 Rupani has also announced that petrol and diesel prices will come down in the state, though he has not given a timeframe. The perception in the BJP, that is ruling Gujarat since 1995, and rightly so is that Modi alone could dwarf all caste contradictions and anti-incumbency in the state just by a few visits with his "vikas purush" (development man) positioning. That the prime minister is on a veritable foundation stone-laying spree during this visit is also to forcefully drum home the message of development. Prime Minister Narendra Modi will lay the foundation stone of the Rs 1,200-crore Devi Ni Mori International Buddhist complex near Shamlaji in Aravalli district, also in North Gujarat, News18 reported. According to News18, Prime Minister Narendra Modi would pass by his school and also the old railway station where his father's tea stall was located. The hoardings also highlight several achievements of Modi's three-year rule at the Centre. 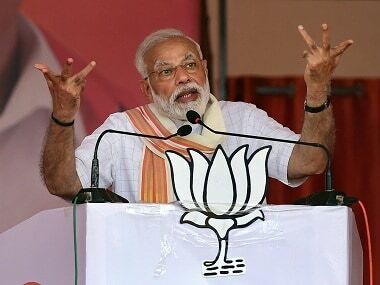 Under attack over the Gujarat model of development, Modi took a swipe at the Congress over economic progress under its governments, saying for them it meant installing a hand pump and asking for votes in return. In the afternoon, he will reach Bharuch and lay the foundation stone for Bhadbhut Barrage to be built over Narmada River. 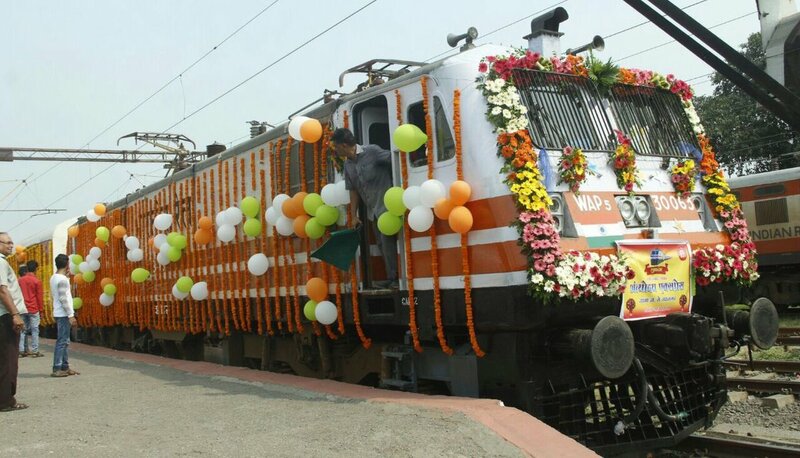 Modi will also flag off the Antyodaya Express between Udhna (Surat, Gujarat) and Jaynagar (Bihar). He will address a public meeting in Bharuch before returning to Delhi. Prime Minister Narendra Modi said yesterday's changes in the GST regime giving relief to small and medium businesses have been hailed across the country as they kindled the festive mood of Diwali a fortnight before it is celebrated. While Modi has visited Gujarat quite often in the last three and a half years, this is prime minister's first visit to Vadnagar after he took power in May 2014. The prime minister is in the poll-bound home state for a third time in less than a month. Last time around, he inaugurated the Sardar Sarovar Dam project. Before that he had welcomed Japan's Shinzo Abe to his home state during his state visit. While opening his speech, Modi remembered his childhood days when he sold tea at the railway station in his hometown Vadnagar. "You all are IITians. But I am the one who is just a 'teaian', a chaiwala" Modi said, evoking laughter from the audience. Prime Minister Narendra Modi today met his old friend and long-time RSS pracharak Haribhai Adhunik during his visit to the famous Dwarkadhish Temple. While leaving the temple after offering prayers this morning, Modi walked towards Adhunik upon spotting him standing with some people in the temple courtyard. Apart from being an RSS worker, Dwarka-resident Adhunik is also a member of the administrative committee of the famous temple. Modi is also scheduled to dedicate the redeveloped Sharmistha Lake to the people and inaugurate other public works, including the facelift of the Vadnagar railway station, where he is once said to have sold tea as a school boy, reports IANS. Prime Minister Narendra Modi will be visiting his home town of Vadnagar and inaugurate a Rs 500 crore government hospital and a medical college. Modi spent his formative years in Vadnagar before leaving home to pursue a life in public service. "We needed to take only 4 percent of land from farmlands for this airport. 96 percent of barren land was taken for this airport," said Modi, talking about the greenfield airport in Rajkot, which was inaugurated by the prime minister earlier. "The day is not far when this (Rajkot) airport will have international services," he said. "This Narmada project will become a sukh-sagar in the future," he added. Modi also said that his government helped in the development of dairy industry in Surendranagar. "Because of Narmada's water, new employment opportunities will come up in Surendranagar. It will also become an important place for education," said Modi in Rajkot. The prime minister, during his two-day visit, will travel through Saurashtra, which sends the highest number of legislators to the 182-seat Gujarat Assembly. Earlier, Rahul Gandhi had also gone to Saurashtra region and had targetted the Modi government. On Sunday, Prime Minister Narendra Modi will visit his hometown Vadnagar in North Gujarat to inaugurate a Rs 500-crore civil hospital and a medical college. Modi is also scheduled to dedicate the redeveloped Sharmistha Lake to the people and inaugurate other public works, including the facelift of the Vadnagar railway station, where he is once said to have sold tea as a school boy. Modi on Saturday said Diwali had come early because of the relaxation in GST rules that brought some relief to small and medium businesses. Modi sounded the poll bugle for the assembly elections to be conducted later this year in Gujarat by addressing a gathering in the temple town of Dwarka after laying the foundation stone for a four-lane signature bridge costing Rs 900 crore linking Dwarka with the island religious tourist centre of Bet Dwarka. 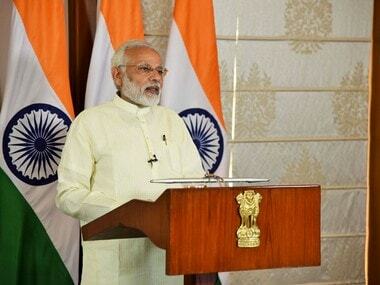 Modi on Saturday said that the present central government is the first since independence that has formulated a National Civil Aviation Policy (NCAP) for providing air connectivity to smaller cities. 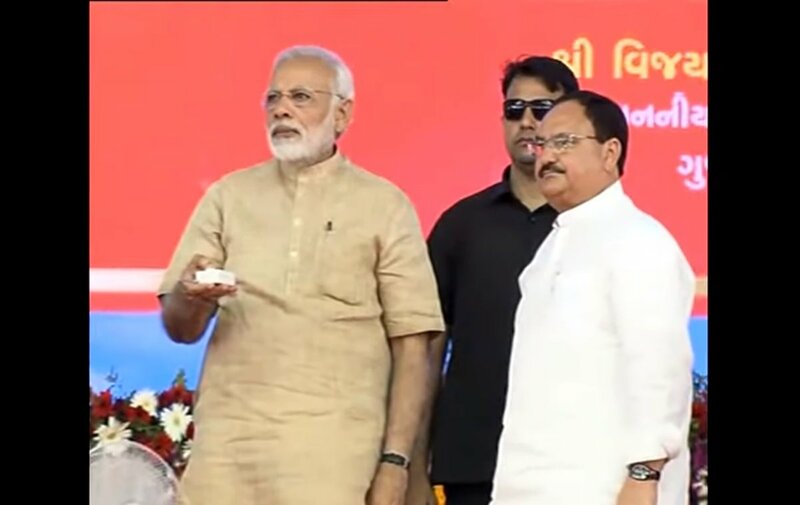 Modi talked about the NCAP at a foundation stone laying ceremony held here for development of a new airport. According to state-run Airports Authority of India (AAI), Modi who addressed a gathering at the ceremony, highlighted the importance that an airport plays in achieving development goals of a region and a state. "He (Modi) also brought to light the fact that for the new greenfield airport coming up between Rajkot and Surendranagar districts, 96 per cent of the land used was barren land of government of Gujarat," the AAI statement said. The Gujarat government had proposed a greenfield airport at Hirasar, Rajkot as the existing airport faces capacity constrains with no further scope for expansion. The initial development phase cost of the new airport has been pegged at Rs 1,405 crore. Commenting on the new airport project being handled by AAI, Civil Aviation Minister P. Ashok Gajapathi Raju said: "Since the existing airport has no scope of further expansion and is not positioned well to meet the potential traffic demand, the new airport being constructed by AAI will surely meet the futuristic demands of Rajkot and will further add to the infrastructural development of this expanding city." The existing Rajkot airport currently witnesses around 100 movements per week and handled over 4 lakh passengers during 2016-17.